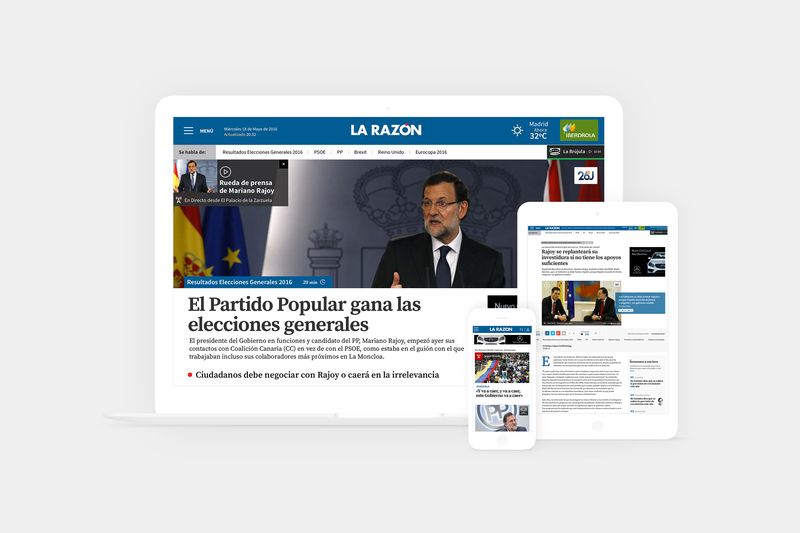 In 2016 consumption through mobile devices began to achieve desktop results and La Razón needed to better adapt its web channel. After making some changes and generating new content related to its 2012 design, they decided to find a partner with whom to evolve and carry out all the improvements that had been put in place during the previous months. We won their trust and our collaboration began. For 10 straight months of collaboration and with a 3-person design team with 100% dedication, we created a design system capable of adapting to the rapid digital transformation process demanded by the publishing market, improving and simplifying editorial management and introducing new options in the CMS which were adapted to the communication needs of the written content. La Razón had a CMS based on a template with many limitations, which restricted the work of the writing team. Also advertising, which at a newspaper represents 80% of revenues, had a huge influence on the work of the digital writing. Both the location and the amount of advertising elements conditioned the project greatly and represented an important challenge. As a reference, just on the digital cover we had to include 35 advertising elements, of which 25 had standard sizes and the rest had their own proportions. From the beginning we knew that we had to implement an editorial design system to be able to reach the customer's objectives, as well as respond to two fundamental operational and business needs: scalability and consistency. In the first place, we needed to understand La Razón's way of working and its context. That is why we had several internal sessions with their writing team. In addition, we conducted a thorough benchmark of other companies in the sector, in which we analysed and collected information on good practices (and not so good), thus identifying multiple opportunities for improvement. We tested the results with the client in a workshop that we organised to generate a conversation around the new elements, and edited the product roadmap along the way. One of the difficulties with which we found ourselves in this collaboration was to achieve leadership in the management of such a multidisciplinary team. It was necessary to ensure the push of tasks and dialogue between the three companies involved: La Razón, (which also had a complex internal organisation formed by different departments with very different goals and pain points), ProtectMedia as the CMS provider and us. This leadership, necessary for the proper functioning of the project, was carried out by Blanca and Iciar, responsible for the Bimp Consulting team. Its role was to streamline, invigorate and facilitate decision-making, which greatly improved communication between all parties. The new design of La Razón was built on a design system based on a grid divided into 12 columns on which flow all the necessary elements making up the newspaper, hierarchizing the contents through different compositions of these elements, which offers much more freedom to the writing team. In this way we build covers and covers with a modular system based on two concepts: the grid divides the structure horizontally with different perspectives, and the sectors and containers create content areas organised by theme or by vertical section. With this we achieved the adaptation of the design to different responses, which converted the content to different resolutions and devices. The main objective of any digital newspaper is to increase the number of visits and increase the average amount of news viewed by the user. The medium monetises this increase through advertising. During the initial workshops, we gained insight concerning the way in which the advertising business developed in the medium. Advertising contracts are usually initiated by the construction of personal relationships between the commercial team of La Razón and the advertisers. In these relationships, the center of the conversation revolves around advertising in the edition of the paper and its associated formats, with the digital channel being an addition. In addition, the work on traditional and convergent formats provided greater bargaining power to advertisers. In order to turn the balance in favor of La Razón, we proposed a greater personalisation of advertising and content through features that digitally gave options that the newspaper did not allow. The new features were created in such a way that they could be generated quickly from the modules proposed. These modules were so versatile that they could even be used for news features. To achieve this, we introduced the same options in the different features as in the rest of the newspaper, which would give the writing team an option to choose the type of template to create grouped news based on specific topics. As a consequence, we created a feature for the day to day, able to reflect the evolution of a current issue and show all the related news in its category, which would allow both the editor and the reader to have all the information generated so far in a same place, following the evolution of the original news topic. We also proposed another type of feature in depth, such as one that responds to the death of a relevant personality among public opinion such as the death of Fidel Castro. With the new design system, La Razón would be able to anticipate the actions of other newspapers and sources of information when offering, in a very agile way, a unique feature, providing a more impressive experience for the user and providing a differentiation from the competition. All this thanks to a simpler conception of the processes, avoiding any increased workload for the writing team. In short, the design system we have provided for La Razón is a tool used to create news features that can easily grow organically through modules and categories, interspersing the information in different formats such as lists, photo galleries, infographics, etc. while making consumption of this content much more digestible and attractive to the user. This means an increase in the number of visits, the average time per visit, the number of news views per session, and other KPIs relevant to publishing world online. The immersive news features also improve the reader's experience as far as advertising is concerned, since something new was provided. How? Allowing advertisers to sponsor these spaces with relevant content and themes treated with care. The condition of this immersive format was that the values ​​of the advertiser brands shared characteristics or qualities implicit in the content of the news. In addition, the interest shown by the reader would make the displayed ads more relevant by adapting themselves to the content of the news. The immersive features allowed us to tap into the tremendous competitive advantage of more traditional media: its huge archive. 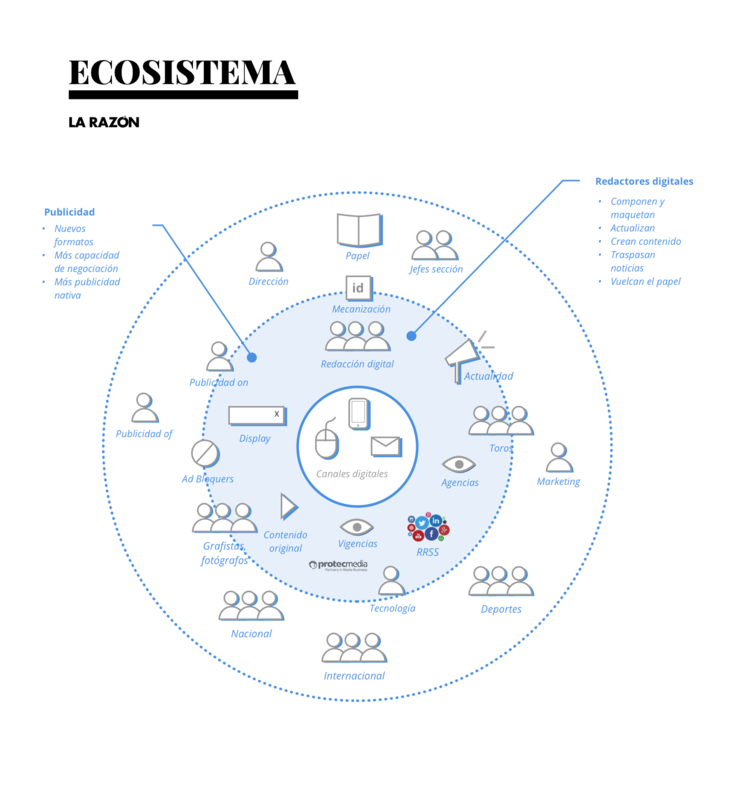 Implementing a design system in an organisation such as La Razón gives the newspaper a peace of mind and a confidence in its method that allows it to focus on the content. This is because the system gives the possibility of choosing multiple options and formats that give more freedom when it comes to showing content. This implementation is tremendously complicated, since it affects all areas and layers of the organisation, as well as all the components of the product: its visual language, architecture, communication, news, verticals, sections and modules. To achieve this, we use design as a lever to change a digital product capable of adapting quickly to the process of transformation of the publishing market. A product that also simplifies the management and experience of all those involved, introducing new options within in the CMS which are adapted to the communication needs of the newsroom.